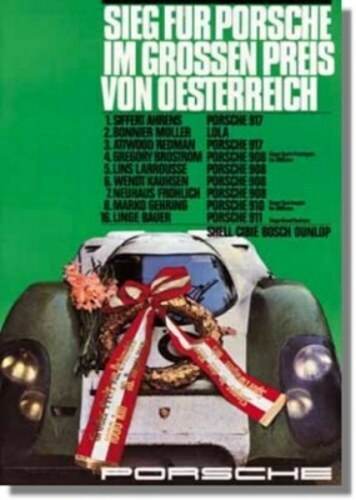 1969 Porsche Grossen Preis von Oesterreich victory poster, reproduction. Originally issued to celebrate the success of Jo Siffert and Kurt Ahrens in the Porsche 917 in the Grand Prix of Austria, this is a reprint made under license of Porsche AG. Measures approximately 20 x 26 inches. 1962 Porsche Dan Gurney Grand Prix of France victory poster, reproduction. Originally issued in 1962 to celebrate Dan Gurney's victory in the Grand Prix of France, this is a reprint made under license of Porsche AG. Vintage 1986 Porsche Rally Paris-Dakar Victory Poster, Original. Original Porsche factory poster, issued at the occasion of the success of the marque at the 1986 Rallye Paris - Dakar where Rene Medge / Dominic Lemoyne took overall victory, Jacky Ickx / Claude Brasseur second and Roland Kissmaul / Rolf Unger 6th overall. Very good condition for its age but with some fraying to the right side hence reduced in price.